Provide mobile power supplies to be used in material handling equipment such as stackers and dockside cranes. 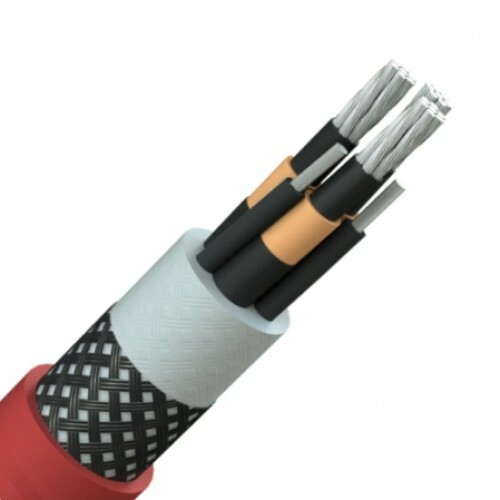 Ideal for drum reeling application as these cables can withstand high mechanical stresses and frequent bending at high speed due to the anti-torsion braid design. Single Core - Fine tinned copper wire strands covered with a semi-conductive rubber layer, Ethylene Propylene Rubber (EPR) insulation, semi-conductive rubber layer, tinned copper wire screen, abrasion resistant PCP rubber sheath - red. Multicore - Fine tinned copper wire strands covered with a semi-conductive rubber layer, Ethylene Propylene Rubber (EPR) insulation, semi-conductive rubber layer, cores twisted together with reduced cores laid in the interstices, PCP inner sheath, textile anti-torsion braid, abrasion resistant PCP rubber sheath - red.